World Weather Attribution: Trump Was Right – America Could Have Done With Some Good Old Global Warming. The first responder team at World Weather Attribution have declared that the exceptionally cold winter thus far in the eastern US and and Canada is . . . . . “exceptional in the current climate”. Like, wow. Before we get into the in-depth analysis which has prompted this altogether startling and unexpected conclusion, let’s get the good news over and done with: “good old global warming” didn’t make this extreme cold event any more likely according to WWA. We do not find any evidence for an intensification of these types of cold waves due to the Arctic warming faster than the midlatitudes. On the contrary, they seem to be warming faster than the winter mean as the Arctic air coming south is less cold now. We also investigated the possible role of circulation changes on the changes in probability, as there have been suggestions that the probability of cold outbreaks has increased due to the smaller temperature contrast with the Arctic. Sea level pressure at 45ºN, 95ºW is most strongly correlated with 14-day cold anomalies in the index regions, and was, indeed, persistently high during the period of the cold wave. This gives rise to the northerly flow that brings Arctic air down over eastern North America. The trend in annual maximum of 14-day averaged pressure at this point has been negative since the late 1970s, contradicting the hypothesis that northerly flows here have increased due to strong Arctic warming. This agrees with reviews of the effect of Arctic warming on the jet stream (e.g., Barnes and Screen, 2015). So nothing ’caused’ this really extreme cold, it just happened, because that’s what weather is like, (though Joe Bastardi made a fairly good prediction months in advance – based on studying patterns of weather). But WWA are at pains to stress that in a warming climate, such periods of intense, prolonged winter cold are, and will become, a lot less likely. Didn’t see that one coming. So, although this cold spell would not have been unusual before global warming, it is now a relatively rare event in any one region. The chance of a cold wave anywhere in North America is much larger than in this specific location. ‘This specific location’. Naturally, a cold event anywhere in north America is going to be more likely than a cold event in any one specific location but what about a cold event that simultaneously encompasses most of the contiguous US and a large part of Canada? Surely, that would be a lot less likely in a warming climate? I say this because WWA choose to define a somewhat limited geographical area which appears to be unjustified given the huge area affected by colder than average temperatures and even much colder than average temperatures. . . . . . . the temperatures over December 26, 2017 through January 7, 2018 are much colder than expected for this time of year, with deviations below the 1981–2010 mean close to 25ºF (14°C) (Fig. 3). Average winter temperatures in the area in question warmed considerably from 1910 to 1930 and stayed warm until the 1940s. There was a long cooling trend from 1940s to 1980. Winters once again warmed until some time around 2010, when they start to dip. In tandem with the average warming and cooling periods, the frequency and intensity of extreme cold periods became correspondingly lesser or greater. In today’s ‘warmer climate’ (which is only marginally warmer on average than it was in the 1930s – for this region and this two week period) the 2017/18 extreme cold stands out as exceptional. If the pattern of ups and downs suggestive of a natural climate/ocean cycle (AMO?) is anything to go by, the US should expect a declining trend in winter temperatures and a greater frequency of extreme cold periods in the coming decades. So thank you World Weather Attribution, you have confirmed that the extreme cold in America this year was ‘just weather’, not “good old global warming”, that it was not caused by a warming Arctic and that, all things being equal, Americans and Canadians should prepare for a decade or two of colder than average winters very soon. Perhaps time to ditch unreliables and make sure fossil fuel and nuclear generation capacity is sufficient to keep people warm. Tags: climate change, extreme weather, global warming, science, United States, World Weather Attribution. Bookmark the permalink. The news is reporting that the valve turners trials scheduled for these winter months are being delayed until spring. Coincidence? If you believe that the evidence is convincing that AGW is happening then clearly ALL changes in the weather should be affected by it. Warm events and those that could be attributed to warmer conditions like hurricanes are easy to accommodate into the explanation, but cold events MUST also be attributed, not to maintain the fiction but because AGW is occurring and therefore the cold events simply must be manifestations of the changes. It’s up to us to use our intelligence to explain how and why. More difficult, but like much of science, when we successfully explain a difficult problem, the stronger we make our overall thesis. Climate change cannot be overthrown by minor, short-term cold snaps. Already we have the beginnings of an explanation involving the jet stream and these new fangled “Roseberry Waves” that the punters haven’t heard about and sound utterly convincing. Richard, solid stuff as usual from Ridley and Peiser. I seriously doubt that hard facts and figures are going to stop these alarmist opportunists jumping on every bad weather event to claim it is evidence of climate change. This is because they’re having such difficulty communicating the ‘urgency’ of the situation otherwise, particularly when global mean temperatures are failing to rise as meteorically as they should be rising if concentrations of GHGs were as efficacious as scientists keep telling us they are. They’ll just keep shamelessly pushing those buttons in the press and the public consciousness because they know that lies and distortions work, regardless of whether they are ethical. They can even solve the ethics conundrum (in their own minds at least) by claiming that a few ‘white lies’ about extreme weather is for the greater good of the planet if it communicates – even illegitimately – the seriousness of the long term impacts of climate change. All we can do is carry on exposing their white lies and keep chucking egg in their faces in the hope that funding for their ‘research’ will eventually dry up. 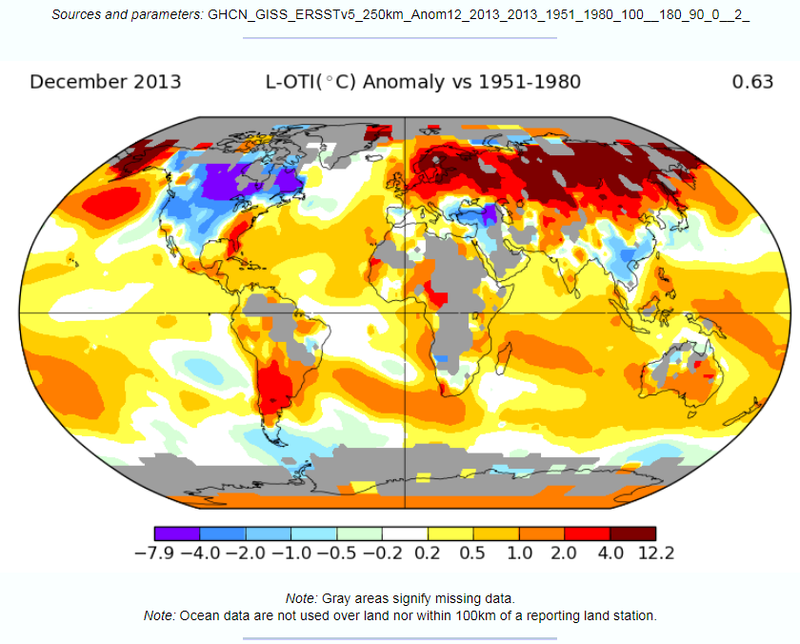 Despite the obvious biases in GISSTEMP temperature data set, they do produce some lovely temperature anomaly graphs. This is one at 250km smoothing for 2013 compared to a baseline 1951-1980 period. You will notice that whilst on average there was 0.63°C of warming (though maybe somewhat less by a more objective average), in most of the United States there was cooling. This is particularly the case in middle America and across the West. Climate scepticism in the USA might be down to people being told that the world is warming, yet in people’s own lifetime’s they are goddam sure it is a lot colder. Around the Great Lakes, it seems it has gotten 6-12°F colder, whilst the folks in Washington are saying that they must shut-down American industries to stop 3°F of global warming. When people cannot understand why people voted for President someone who says Global Warming is a hoax, it might be worth getting some perspective on local realities.